Kissin live in Tokyo, Suntory Hall,May ,1987. 2-page liner notes, 1 1/2 pages in Russian, 1/2 page in English. On Wednesday, 18 APR 2018, I listened to one 2 CD set. 1-2) |CD 1--Tr. 1. Franz Liszt (1811-86): Les Preludes (1865) (15'38) |Tr. 2-5. L.V. Beethoven (1770-1827): Symphony 8 in F Major, Op. 93 (1812) (24'24) |Tr. 6. Felix Mendelssohn (1809-47): The Hebrides, Op. 26 a concert overture (1830, rev. 1832) (8'59) |Tr. 7. Giacomo Rossini (1792-1868): Guillaume Tell, an opera in 4 acts: Overture (1829) (12'29) ||CD 2--Tr. 1. Hector Berlioz (1803-69): Benvenuto Cellini, an opera semiseria in two acts (1838): Overture (10'05) |Tr. 2-5. Johannes Brahms (1833-97): The Piano Concerto No. 2 in B♭ major, Op. 83 (1881) (45'05)--Paul van Kempen (1893-1955), cond., Berlin Philharmonic Orch., Adrian Aeschbacher, piano (PC). Rec. CD 1, Tr. 1--22 DEC 1937, Tr. 2-5--7 APR & 4 OCT 1940, Tr. 6--26, 28 MAY 1951, Tr. 7--5 JUL 1951. Rec. CD 2--Tr. 1--5 JUL 1951, Tr. 2-5. 14, 21 JAN 1952--a 2 TAHRA CD set. Obviously, the two major works on this program are the Beethoven 8th and the Brahms PC 2. Two basic ways of interpreting the Beethoven 8th have emerged over the years. It is well known that Beethoven saw this as self parody, and indeed it is. But how do you do that? One way is to play it with a smaller then usual orchestra for a Beethoven symphony, and have the musicians stretch their muscles, so to speak, in a comic way, like a four year old in a Superman costume on Halloween. The other is to do exactly the opposite and play it with an orchestra seemingly bloated with a sense of self importance, so that it becomes comic in its overexaggereation. I think the former approach is best exemplefied by George Szell's Cleveland recording. Pablo Casals, to name just one, did the same with his Marlboro Festival players, but, I think, less successfully. It is to this school that Paul van Kempen belongs. The best example of the latter approach, I think, is Georg Solti's in both of his recordings with the CSO. I personally prefer the Szell-van Kampen approach. I was interested to hear Adrian Aeschbacher in the Brahms. I have only a couple of his records, both issued by KASP records, owned by my online friend Donald Isler. This is a good performance, but nothing special distinguishes it, as far as I can tell, until the last two movements. The poetic reverie he and van Kampen achieve in the third movement is wonderful, and the last movement is a virtuoso exercise. Recommended. I recommend it, though, only because you can never have too many recordings of this work. I have well over a dozen, and this is a long way from my favorite. My #1 favorite, bar none, is the Pollini/Abbado/VPO recording. 2nd & 3rd, very close to one another, are the Fleisher/Szell/Cleveland and the Serkin/Szell/Cleveland efforts. My fourth favorite is the Moravec/Belohlavek/Czech Phil. recording on Supraphon. I am now on the final cd of the EMI/Bruckner Symphonies box/Jochum/Dresden. Really good! ​I recommend it, though, only because you can never have too many recordings of this work. I have well over a dozen, and this is a long way from my favorite. My #1 favorite, bar none, is the Pollini/Abbado/VPO recording. You have heard, as well, the 1958 Gilels / Reiner / Chicago Sym Brahms PC # 2 I assume. I have, and it's 'way up there as to my favorite. The other is Richter/Leinsdorf/Chicago, the second movement of which was recorded in one take! On Thursday, 19 APR 2018, I listened to 3 CDs. |Tr. 2. Lullabye for Kara for cello & piano (2002) (7'17) |Tr. 3. Variations on a Hiking Song for piano solo (1992) (13'52) |Tr. 4-6. Impressionist Suite 2 for oboe, A clarinet, & bassoon (2000) (12'51) |Tr. 7. The View from Carew: Romance for B Flat clarinet, cello, & piano (2000) (10'00)--Anthony Costa, clarinet (Tr. 1, 7), Phil Amalong, piano (Tr 1-3, 7), Jeff Schoyen, cello (Tr. 2, 7), Mark Ostoich, oboe (Tr. 4-6), Ron Aufmann, clarinet (Tr. 4-6), Mark Ortwein, bassoon (Tr. 4-6). No information on recording dates or venues, but Sowash does thank WGUC-FM, the Cincinnati classical music radio station for help in the production of this CD. CD was copyrighted 2004 by Rick Sowash Publishing Co. The first piece has three meanings, says, Sowash. First, it evokes the peculiar feelings we have entering a large, empty space intended for crowds of people, in this case the sanctuary of a church in the deep of the night. It is empty but not quite silent--hear the little creaks and murmurs of an old building, the chimes ringing in the steeple above, and perhaps the ghostly echo of a remembered hymn. But the piece is also about the idea of sanctuary--a safe place during the dark night of the soul. Finally, it affirms the comfort we still feel in old-fashioned tonality and tunefulness. Even at this late hour, after the agoncy that characterized so much of 20th century music, we can return to the sanctuary of G Major and g minor and take refuge in a slow, sad tune. Lullabye for Kara was written for the infant child of a couple who were friends of Sowash's, the same couple, in fact, who had had him compose the Mt Airy Suite for their wedding ceremony, Mt Airy being a Cincinnati city park in which the wedding took place. The Hiking Song is "The Happy Wanderer" by Friedrich Moller, the inspiration for Schubert's Wandrer Fantasy. Sowash was writing these variations while his father lay dying, and is dedicated to his memory. The final variation is a tiny, faint, but heartfelt requiem. The Impressionist Suites were written for a friend of Sowash's, French clarinetist Lucien Aubert and his reed ensemble, Le trio d'anches Ozi. The original suite had 6 movements, each inspired by a different French impressionist painter. But Sowash judged it too long, so he broke it up into two suites; this is the second. Its 3 movements are 1) Cassatt: A Lullabye (3'32), 2) Caillebotte: Precision (4'13) 3) Sisley & Bazille: Joyful Skies, Lament for the Fallen (5'06). The View from Carew refers to the Carew Tower, the tallest building in Cincinnati, where Sowash lives. The piece is about a man contemplating the end of a deeply felt love affair. It has two themes, a love theme, and a loss theme, which are developed and resolved in a single, classic sonata allegro movement. 2) W.A. Mozart (1856-91): |Tr. 1-4. Symphony 29 in A Major, K. 201 (186a) (31'39) |Tr. 5-8. Symphony 28 in C Major, K. 200 (189k) (25'45) |Tr. 9-12. Symphony 33 in B Flat Major, K. 319 (22'41)--Trevor Pinnock, cond., The English Concert. Rec. Henry Wood Hall, London, 3/1994 (K. 200-1), 9/94 (K. 319). CD 8 of an 11 Arkiv Produktion CD set of Mozart's "complete" symphonies by these forces. We're getting into some of the more familiar symphonies with these. They feel like greeting old friends. They leave one with a warm, cozy feeling of familiarity without the slightest bit of contempt, but admiration and wonder. 3) Sergei Rachmaninoff (1873-1943): |Tr. 1-3. Piano Concerto 2 in C Minor, Op. 18 (33'27) |Tr. 4. Rhapsody on a Theme of Pagainini, Op. 43 (23'05)--Gary Graffman, piano, Leonard Bernstein, cond., NYPO. Rec. in the worst hall in the world, NYC, 26 MAY 1964 (Tr. 1-3), 2 MAY 1964 (Tr. 4). CD 13 of a 24 CD SONY set titled "Gary Graffman: The Complete RCA & Columbia album collection." The LP verson of this issue was among the first 20-30 records I ever bought. It is an old friend I haven't heard from in years. These performances are great ones in the best sound available at the time, and that was pretty damn good. Highly recommended. For some fool reason I forgot about the Richter/Leinsdorf which is my second favorite. No, I haven't heard the Gilels/Reiner, but I will look into it. I am not that big a Gilels fan, but I am, of course, a big Reiner fan. No, I haven't heard the Gilels/Reiner, but I will look into it. I am not that big a Gilels fan, but I am, of course, a big Reiner fan. I think you'll enjoy the Gilels/Reiner. Apparently Gilels had not yet memorized the entire work at the time of recording, which irritated Reiner, but you'd not guess either from the result.Recorded in 1 day if I recall.Cellist was Janos Starker. I think you'll enjoy the Gilels/Reiner. Forgot to mention you may also wish to hear Backhaus/Bohm/VPO Brahms PC # 2 , 1969 if I recall, mine a Decca Legends cd if I recall .Backhaus ' last concerto recording. I think its great, as well. There we disagree. Backhaus was a great pianist, but Bohm, like many German conductors, drags tempo ever so slightly: thus, the performance lacks the electricity of Reiner or Leinsdorf. MHO, but there it is. Also, by then Backhaus was no longer the pianist who recorded the concerto in Dresden just before the War, with a younger Karl Bohm. Backhaus's fingers were still in good shape but his playing had become monochromatic and rather rigid. There's also a monaural Decca recording with Schuricht and the VPO which I haven't heard. I know this last. I am coming up to it soon in the Schuricht DECCA box I am currently going through. On Thursday, 20 APR 2018, I listened to CD 2 in the Previn cycle of the Vaughan Williams Symphonies, and the other two works on the CD. Then, for comparison with the Previn Vaughan Williams London Symphony, I listened to the two other recordings of that symphony in my collection. 1) Ralph Vaughan Williams (1872-1958): |Tr. 1-4. Symphony 2 "A London Symphony" (1911-13) (46'20) |Tr. 5-7. Concerto Accademico for Violin & Orchestra in D Minor (15'59) |Tr. 8. The Wasps: Overture (8'59)--Andre Previn, cond., London Symphony Orch., James Oliver Buswell IV, violin (Tr. 5-7). CD 2 of a 6 CD RCA set of the VW Symphonies by these forces. 2) The Adrian Boult recording of the VW 2, London Philharmonic Orch. (43'01) Rec. MAR 1971 Kingsway Hall, London. On CD 2 of an 8 CD set of the symphonies + some other orchestral works. The Previn box includes a lavish 104 page booklet in English, German, & French. So why has it no information on recording dates or venues? ONLY THE SHADOW KNOWS! A London Symphony (1911–13) which the composer later observed might more accurately be called a "symphony by a Londoner", is for the most part not overtly pictorial in its presentation of London. Vaughan Williams insisted that it is "self-expressive, and must stand or fall as 'absolute' music". There are some references to the urban soundscape: brief impressions of street music, with the sound of the barrel organ mimicked by the orchestra; the characteristic chant of the lavender-seller; the jingle of hansom cabs; and the chimes of Big Ben played by harp and clarinet. But commentators have heard—and the composer never denied or confirmed—some social comment in sinister echoes at the end of the scherzo and an orchestral outburst of pain and despair at the opening of the finale. Schwartz comments that the symphony, in its "unified presentation of widely heterogeneous elements", is "very much like the city itself". Vaughan Williams said in his later years that this was his favourite of the symphonies. The Previn recording is very laid back and contemplative, and the slowest of these performances. The Boult is energetic and full of drama and excitement. The Sargent seems to steer a middle course. One peculiarity is that it begins and ends quietly, very much like the Shostokovich Eleventh Symphony. By the mid-1960s his health began to deteriorate. His final conducting appearances were on 6 and 8 July 1967, leading the Chicago Symphony Orchestra at the Ravinia Festival. On 6 July Sargent conducted Holst's The Perfect Fool, Henryk Wieniawski's Second Violin Concerto with Itzhak Perlman, and Vaughan Williams's A London Symphony. On 8 July he led Vaughan Williams's Overture to The Wasps, Delius's The Walk to the Paradise Garden, Prokofiev's Piano Concerto No. 4 with David Bar-Illan, and Sibelius's Symphony No. 2. Sargent underwent surgery in July 1967 for pancreatic cancer but made a valedictory appearance at the end of the last night of the Proms in September that year, handing over the baton to his successor, Colin Davis. He died two weeks later, at the age of 72. He was buried in Stamford cemetery alongside members of his family. Malcolm Sargent's only CSO appearances were two Ravinia Festival concerts in July, 1967. The highlight of his first concert was Vaughan Williams's London Symphony, a bracing reading that does not slight the work's poetic moments. Despite his affinity for the composer (he premiered the Ninth Symphony and the Oboe Concerto) Sargent made no recordings of Vaughan Williams symphonies. He secured enthusiastic response from the CSO in a relatively unfamiliar score, and confirmed his own description of the symphony as depicting "the power, the glamour, the striving and achievement of a great city." Reviewer Thomas Willis referred to Sargent's youthful elegance at seventy-two, but these concerts were among his last [actually, the were his very last two concerts]. CSO members sensed his declining health. Sargent was too ill upon returning to England to lead the Proms season. He bravely left his sickbed to speak at the Proms Last Night, but succumbed to cancer on October 3, 1967. On Saturday, 21 APR 2018, I listened to 2 CDs. 1) Lowell Liebermann (b. 22 FEB 1961): 25 songs. Robert White, tenor, Lowell Liebermann, piano--Rec. at SUNY--Purchase Performing Arts Center Recital Hall 19-24 MAR 2000. Arabesque Records CD. |Tr. 1. Out of the Cradle Endlessly Rocking, Op. 41 (1993) (12''24) Text: Walt Whitman. |Tr. 2-7. Six Songs on Poems of Henry Wadsworth Longfellow, Op. 57 (1997) (16'08) |Tr. 8-13. Final Songs, Op. 21 (9'17) |Tr. 14-16. Three Dream Songs, Op. 53 (4'22) |Tr. 17-22. A Poet to His Beloved. Op. 40 (13'57) |Tr. 23-25. Night Songs, Op. 22 (5'55). On the fourth to last unnumbered page (counting the back cover as a page), is this statement: "Mr. Liebermann's works are published exclusively by Theodore Presser Company and he is a Yamaha artist." Then, two pages later, on the inside back cover, the piano used for this recording is listed as "Steinway 812." MOMMY, I'M CONFUSED! Out of the Cradle...,Op. 41 was originally composed in 199e for mezzo-soprano & string quartet. This is the premiere performance of the tenor-piano version. The Longfellow poems were LL's response to a commission from the Geraldine C & Emorty Ford Foundation for a setting of "poems of a romantic nature," and LL chose these HWL poems as his response to the commission. It was composed in 1997 and first performed by White & Liebermann. The Final Songs have that title not because they are some sort of valedictory works--the early opus number shows they are not. But they all deal with death and loss, thus the title. Among them are Robert Graves's "Death by Drums," Randall Jarrell's "Farwell Symphony," and of Rod Jellema's "Listening to Comrade Shostakovich on the Day of His Death," LL writes, "My setting includes a fleeting reference to Shostakovich's Viola Sonata, his very last completed work, composed shortly before his death in 1975." The Final Songs is dedicated to Vincent Pershichetti, who was Liebermann's doctoral dissertation supervisor @ Julliard. "I asked Persichetti to look at these songs, and we read them through together. When he finished...he shoved the music away...and told me, 'These are wonderful and they are terrible (in the old Biblical sense" and I don't want to see them again.' I was bewildered by his reaction but two weeks later I learned he had been diagnosed with lung cancer and been given a short time to live. During my recital in which these songs were introduced he was up in his studio working away at things he was determined to finish in the time he had left, but he came down to Paul Hall to hear these songs and thanked me for them." The Three Dream Songs are musical settings of poems by Langston Hughes. It was originally composed for tenor, flute, string quartet, and piano, but Robert White, the tenor here in the tenor-piano version, was also the vocalist at the world premiere performance of the original version. The six texts are by William Butler Yeats. The Night Songs, Op. 22 were premiered on the same program with the Op. 21 Final Songs. They are all poems about sleep written by Mark Van Doren, Robert Graves, & Randall Jarrett, adapted from Rainer Maria Rilke. Texts to all the songs are included into the 24 page unnumbered booklet (counting both the front and back covers as pages). I marked my copy with page numbers for personal reference. Its all in English, no translations. 2) CD 3 in the 10 CD box "Carl Schuricht: The Complete DECCA recordings." |Tr. 1-4. L.V. Beethoven (1770-1827): Symphony 2 in D Major, Op. 36 (32'41) |Tr. 5-8. Johannes Brahms (1833-97): Piano Concert 2 in B Flat Major, Op. 83 (46'11)--Wiener Philharmoniker, Wilhelm Backhaus, piano (Tr. 5-8)--Rec. Greater Hall, Musikverein, Wien, 25-30 MAY 1952. This is one of three Schuricht performances of the Beethven 2 in my collection. Another one is a 30'56 performance with L'Orchestre de la Suisse Romande from 1947 on Disc 1 of this set. The last is his 32'17 1958 stereo recording with the Paris Conservatory Orch. which is part of his 7 CD EMI set of all the Beethoven symphonies + the Bruckner 3, 8, & 9 with the Wiener Phil. Note in particular the wide discrepancies in timings for the 2nd and 3rd movements. In his earliest recording, he gave the second movement alleghretto short shrift, whereas in the two later ones, they get much more expansive treatment. By contrast, he lingers over the scherzo in the first recording, but shortens them up by almost half in the last two. In the present recording, the 1952 one, he really lingers on, one might almost say, caresses the second movement. The Brahms PC 2 is an excellent recording. Backhaus was born 26 MAR 1884. When he made this recording in MAY 1952, he was age 68. He died 5 JUL 1969 at age 85. Here, he is still young enough that his powers are undiminished, but not so old as to be in a deteriorating state. Somehow, I sense some slight problem with this recording. It seems not to have picked up a certain range of frequencies, the cello solo in the third movement seems a tad wan, as if some tones in its midrange are missing, and the piano sounds a little off, too. I don't know what it is. This was made in Vienna. Backhaus was known to favor Bosendorfer pianos, and they are made in Vienna, so it would be strange if the piano were other than a Bosendorfer, though the liner notes do not say if it was or not. But the discrepancy could not have been in the piano. Maybe there was something wrong with the mics, or with the transfer here, I know not what. Otherwise, this is a fine performance. All the deficiencies seem to be in the recording, not the musicians. Reb, I have a five-CD boxed set of Schuricht's recordings issued by Decca around 2004 [475.6074) that has much (or half) of the material in the ten-CD box you have. It appears as though everything in the set I have was issued on LPs. This box includes the 1952 recording of Brahms' PC #2 w/Backhaus. I don't recall having any problem with that, but I will listen again to my copy. A shame Decca didn't reissue all of Schuricht's Decca recordings in one box until recently. Apparently most of the other material is taken from 78-rpm discs and remastered accordingly for this now Decca complete edition. There seems to be a huge resurgence of interest in Carl Schuricht so Decca jumped on the bandwagon. Schuricht recorded prolifically for EMI, Decca, lots on Hanssler, and a wide variety of other labels, including live performances. Some of his material appeared on EMI's Great Conductor series, and he also appears in Philips' Great Pianists series. Funny, I cannot recall at the moment (a late moment!) as to what was so convincing about his conducting. However, he was considered "a great conductor" by those in the know. I would like to hear what John Francis thinks of this conductor. You are also correct about Backhaus being a Bosendorfer artist; but he was known to play other pianos, especially outside of Austria and Germany. Lance wrote: I would like to hear what John Francis thinks of this conductor. I haven't heard many of his recordings, but when my father was filling in the gaps in the family record collection, for some reason it was the Schuricht/VPO London recording he chose for Beethoven's Symphony No. 2. It was a 2-sided LP because, I see now, its timing was 32+ minutes. Playing it back now, I have no memory of it from 60 years ago. The Vienna Philharmonic sounds great, with a really lovely slow movement, though its ensemble isn't precise; those were good years for the orchestra. As for Schuricht's contribution, there's nothing special about it, doubtless why it hasn't stayed in my memory as so many of my "first" recordings have - a good solid mainstream performance. Again Pop chose well. The only other Schuricht recording I can say anything about is his Bruckner 7, I forget which recording. My stepsister was never a big classical music person but somehow she fastened on to that symphony, and for her only her Schuricht recording would do. I listened to it once to find out what it might tell me about her musical taste, and as I remember he moves the music along as I like it (my favorite recording is my first, van Beinum and the Concertgebouw, whom I heard perform it in concert in 1956). Can't really say more. Sorry, Lance, that's about it. I've never collected Schuricht nor felt an impulse to do so, but I've nothing against him either. A knowledgable friend says a 50's recording, live ?, of Schuricht and Backhaus in the "Emperor" is some of Backhuas' best playing. This may be it, although dated 1961. Have not heard, yet. I have Schuricht in an EMI box set of Bruckner VIII & IX, and they are both quite good. Interestingly, his interpretation of VIII fits all on one disc, which makes Schuricht quite a bit faster than Szell, for example, who needs 2 discs for the same music (no cuts in Schurucht). Those same performances have been issued in the new set pictured below, along with his Beethoven, which I haven't heard. On Monday, 23 APR 2018, I listened to 6 CDs. 1) L.V. Beethoven (1770-1827): Tr. 1-4. Symphony 4 in B Flat Major, Op. 60 (30'28) |Tr. 5-8. Symphony 8 in F Major, Op. 93 (26'30)--Pierre Monteux, cond. (both), NDR Sinfonieprchester, Hamburg, Musikhalle Hamburg Studio 1 OCT 1960 (Tr. 1-4), Los Angeles Philharmonic Orch., Hollywood Bowl, live, 5 JUL 1960 (MONO!) --CD 3 of a 5 CD MEMORIES set of the Beethoven symphonies conducted by Monteux with various orchestras. This Fourth is a joy to hear. Monteux's timings are mostly shorter than in his DECCA cycle in both these works. In the 4th, the great sforzando transition begins at abut 3'05 into the first movement, very misterioso up to then. This is an energetic and electric reading full of drama, very much like the Klemperer studio recording. Although it was recorded only a few months earlier, the recording of the 8th sounds like it was from 15 years before. First of all, even though its July, 1960, this is in monoraual sound. And the sound is very muffled, as if they were working with decidedly out of date recording equipment. Its a shame, too, because the performance is interesting. Most readings of the 8th take as their cue the fact that Beethoven himself described it as a self parody. Most performances are, therefore, bombastic in one way or another. Here, Monteux seems to play it straight, as the most restrained and Mozartean of Bethoven's symphonies. I must say the music seems to sustain such a view, though I generally prefer the more conventional one. 2-3) A 2 CD Tahra Records set titled "Hommage a Rudolf Kempe." |CD 1--Franz Schubert (1797-1828): Tr. 1-4. Symphony 9 in C Major, D. 849 (51'23) |CD 2--Tr. 1. Richard Wagner (1813-83): Lohengrin, Act I Prelude (9'15) |Tr. 2-5. Felix Mendelssohn (1810-47): Symphony 3 in A Minor, Op. 56 "Scottish" (38'11). Dresden Staatskapelle Orch., Saxon State Orch. Rec. 1 DEC 1950 (CD 1), 29 DEC 1949 (CD 2, Tr. 1), and 15 JUL 1952 (CD 2, Tr. 2-5). The Mendelssohn licesned from Supraphon. All others are in public domain. The liner notes definitely state that the Mendelssohn was recorded by the Dresden Staatskapelle. They do not make clear which recordings were made by the Saxon State Orchestra, but I assume its all the others, and, of course, they are all conducted by Rudolf Kempe. Pages 8-12 contain an English language narrative about Kempe's life, but its mostly a recitation of the conducting posts he held and when. If you are not clear on those details and want to be, this is a good source. These are pretty much standard readings, nothing interpretively unusual about them, except that the Lohengrin prelude seems very magisterial, even more than usual. In the third movement of the Scottish, Kempe seems to get his feet stuck in a Scottish bog for a bit: the sound is a little muddy. I think this has more to do with the fact that it was recorded in 1952 with perhaps not the best equipment available at the time than it has to do with any interpretive deficiencies on the conductor's part. 4) David Froom (b. 1951): Tr. 1-8. Chamber Concerto (1991) (14'40)--Robert Black, cond., NY Muisic Ensemble (6 players), rec. 20 SEP 1992, Skinner Hall, Vassar College, Poughkeepskie, NY. Tr. 9-16. Piano Suite (1996) (11'17)--Elisa Garth, piano, , rec. 21 SEP 1996 St Mary's Hall, St. Mary's College, of Maryland in St. Mary's City, Maryland. Tr. 20. To Dance to the Whirling Wind (1993) (7'39)--Jayn Rosenfeld, flute--rec date & venue same as for Tr. 9-16. Tr. 21-26. String Quartet (1990) (14'13)--The Ciompi String Quartet (Eric Pritchard, violin, Hsiao-mei Ku, violin, Jonathan Bagg, viola, Fred Raimi, cello)--rec. 2 MAR 1996. Venue, see Tr. 9-16 & 20. An Arabesque Records CD. 5) W.A. Mozart (1756-91): Tr. 1-3. Symphony 32 in G Major, K. 318 (7'34) |Tr. 4-6. Symphony 34 in C Major, K. 338 (21'38) |Tr. 7-10. Symphony 35 in D Major. K. 385 "Haffner" (19'45) |Tr. 11-14. Symphony 36 i C Major, K. 425 "Linz" (31'51)--Trevor Pinnock, cond., The English Concert. (TT: 80'48). Rec. Henry Wood Hall, London, 5/1993 (K. 385), 9/94 (K. 318, 338), & 1/95 (K. 425). CD 9 of an 11 CD ArchivProduktion set of the complete Mozart symphonies by these forces. The last two pieces here are, of course, standard repertoire. They are stylish performances I enjoy, but I must say my preference in these works is the set of the last 6 conducted by Yehudi Menuhin in a 5 CD Virgin Classics set devoted entirely to Mozart. It has what I consider best performances of a number of other works as well. I consider it indispensible for any well-stocked Mozartean. 6) Franz Schubert (1797-1828): Tr. 1-4. Fantasy in C Major, D. 760 "Wanderer" (20'56) |Tr. 5-8. Piano Sonata in C Minor, D. 958 (28'45) (TT: 49'47)--Gary Graffman, piano. Rec. Columbia 30th St Studio, NYC 12 APR 1965 (Tr. 1-4), 11 APR 1963 (Tr. 5-8). CD 14 of the 24 CD SONY set of Graffman's complete RCA & Columbia album collection. These are pieces that nearly every pianist who has shown any interest in Schubert's solo piano music at all has recorded. They are both more or less central to Schubert's solo piano oeuvre. The competition is stiff, but Graffman aquits himself well. He shows enough variation in dynamics in these very repetitive works to sustain the listener's interest, which is one of the major problems with interpreting these works. They're the same orchestra, whose main occupation is as the pit band of the Dresden/Saxon State Opera. Usually the same conductor is music director for the opera and concert performances, as with Rudolf Kempe. Why the inconsistency in Tahra's listing? Maybe the recordings were originally from different sources each using the name it preferred. ​On Tuesday, 24 APR 2018, I listened to 2 CDs. 1) Ralph Vaughan Williams (1872-1958): Tr. 1-4. Symphony 4 "Pastoral" (38'03) |Tr. 5-8. Symphony 4 in F Minor (33'58)--Andre Previn, cond., London Symphony Orch. , Heather Harper, soprano (Tr. 4). Rec. 1969 (4), 1972 (3). CD 3 of a 6 CD set of the complete VW symphonies + some other orchestral and concerted works. Although this release comes with a lavish 104 page booklet with notes in English, French, and German, no information on recording venues or dates is provided. However, I have discovered that a website called http://www.musicweb-international.com/c ... previn.htm has at least the information on recording years from other sources. These two symphonies are often recorded together because they fit well on one CD and because they exemplify the extremes of Vaughan Williams output. Both of them were very controversial when they first appeared, but for different reasons. The 3rd is a pastoral symphony consisting entirely of slow movements, with a vocalist in the last movement. The soprano just vocalizes and makes sounds; no specific words or texts are sung or spoken. It sounds to me a bit like a chill wind both at the beginning and the end of the movement. Not a lot happens. It has been called "massive quietness." The liner notes themselves say it has "given the impression of a half hour of modal meandering in which nothing much happens, and that not very loudly." It has been called his most English of symphonies, evoking the atmospherics of rural England. It turns out, though, our liner notes commentator informs us, that it is in fact very French. It seems that early in his career, just before WWI, VW went to France to study orchestration with Ravel for about 3 months. He said he learned a great deal from that experience, and the third symphony is the first work in which it showed. The 4th, on the other hand, was written in 1935 and is a war symphony. VW saw the war clouds forming, and hated the idea but thought it was going to be necessary. He hated the idea because he had been an ambulance driver in WWI, knew war first hand, and had developed an intense dislike for the whole idea. But he saw what was happening on the continent and felt that war was inevitable; it was just a matter of time. The 4th symphony is a loin-girding exercise, a warning of what is to come, a "buck up, lets get ready and steel ourselves to the inevitable" approach. It is bombastic and entirely instrumental, but affected with a touch of irony in the first movement, where VW says he cadged (his word) material form the Beethoven Ninth Symphony, as if to say, "You Germans ought to be ashamed of yourselves. A nation capable of such nobility ought to know better." And, indeed, what can we say of a people who invented both the kindergarten and the Kinderaktion? 2) Felix Mendelssohn (1809-47): Tr. 1-14. A Minsummer Night's Dream: Incidental Music, Op. 61 (57'28). Andre Previn, cond., London Symphony Orch, Finchley Children's Music Group, Colin Howard, Chorus Master, Lillian Watson, soprano, Delia Wallis, mezzo-soprano. Rec. Kingsway Hall, London, DEC 1976. EMI Classics. I remember being told or reading somewhere at the time this was first issued on LP that it was the first recording ever of the complete incidental music. I tried to pin down the sourcing for that and was unsuccessful. The Wikipedia article on it does mention three other complete versions--one, by Seiji Ozawa and another by Claudio Abbado both date from after this recording. However, it also mentions one by Rafael Frühbeck de Burgos, and it apparently is OOP, and I couldn't find out when it was recorded. So I am left with a mystery. Excerpts from the suite which exclude the vocal movements have been recorded many, many times, but recordings with those movements are still a rarity. I believe this was the first, but I can't prove it. Your commentaries and memories would be weldome. At any rate, this is a wonderful recording. It is bright, enthusiastic and rousing, and in excellent sound as well. The first complete recording of Mendelssohn's incidental music was included in an HMV recording of Shakespeare's play by the Old Vic theatre company with some visiting stars. Malcolm Sargent conducted the BBC Symphony Orchestra in the music, which I believe was never issued separately. That's Robert Helpmann as Oberon speaking at the beginning. Others in the cast included Moira Shearer as Titania and Stanley Holloway as Bottom. Well worth hearing but you have to track down the HMV or RCA Victor album, which is surely a rarity; neither company has reissued it on CD. Toscanini conducted the incidental music (not the full score but not just the suite) in 1947, first as an NBC Symphony broadcast and then in the studio - "You Spotted Snakes" was recorded but for some reason not published. There's a CD reissue on RCA. Toscanini also recorded the incidental music with the Philadelphia Orchestra in the early 1940's: it was finally cleaned up and issued on CD in the 1990's, along with a superb Schubert IX & 3 other discs including La mer. The set is currently available used on amazon for $9.98. On Wenesday, 25 APR 2018, I listened to one CD. CD 4 in the 10 CD box set titled "Carl Schuricht: The Complete Decca Recordings." CD 4 is devoted to two works by Johannes Brahms (1833-97). |Tr. 1-4. Symphony 2 in D Major, Op. 73 (36'37) |Tr. 5-7. Concerto for violin & cello in A Minor, Op. 102 (33'53)--Wiener Philharmonikier, rec. Great Hall, Musikverein, Wien, June 1953 (Tr. 1-4), L'Orchestre d la Suisse Romande, Georg Kulenkampff, violin, Enrico Mainardi, cello, rec. Radio Studio, Geneva, 8 JUL 1947 (Tr. 5-7). (TT: 70'44). Back in the day, when I first started collecting LPs in earnest, the best recording of the Brahms Second was reputed to have been one with the LSO conducted by Pierre Monteux on the Philips World Series budget label. The problem was that @ that time, that label had a justified bad rreputation as one beset by all manner of clicks, pops, ziches and zilches and other manufacturing defects. I could not find one in decent shape. I see now it has been reissued on the Eloquence label, and I have put it on my wants list. This Second Symphony is a fine recording. I especially liked Schuricht's lyricism in the second movement, the peaceful, loving caress of this music. Although the Double is a pretty good performance, it is marred by lots of hiss, as it is an older recording than the symphony, and by the fact that it is with an orchestra that really does not meet the sort of standards the Wiener Phil. does. Kulenkampff and Mainardi, though, were in a trio together with Edwin Fischer, so they were accustomed to working together, and Schuricht was a great musician as well, so this turned out better than it might have. But still, its not the one to have. My personal preference in the Double is a recording on the Supraphon label, also coupled with the Brahms Second Symphony, as it happens, with Karel Ancerl and the Czech Phil. Soloists are Josef Suk and Andre Navarra. On Thursday, 26 APR 2018, I listened to one CD. CD 4 in the 5 CD Memories set of the Beethoven symphonies conducted by Pierre Monteux. |Tr. 1. Fidelio Overture (6'10) |Tr. 2-6. Symphony 6 in F Major, Op. 68 "Pastoral" (40'24) |Tr. 7-10. Symphony 5 in C Minor, Op. 67 (27'57)--Boston Symphony Orch. Live rec. @ Tanglewood 8 AUG 1959. This is the best CD in this box thus far, and I have listened to everything but the Ninth. This is one of the best performances of the Pastoral Symphony I have ever heard. It was a favorite of mine in the DECCA set with the London Symphony, too. Monteux's way with this work emphasizes the lyrical rather than the rhythmic facets of the score, as Szell and Solti both do. On feels one is taking a nice, leisurely walk through the Vienna woods with Monteux, agog at the wonders of nature. Melodic, lush, wide-eyed and bushytailed, this reading is. You'll feel like you're wrapped in velvet when you listen to this. The Fifth is excellent, too, though not quite as spectacular as the Sixth. I'd recommend this whole set just on the basis of this CD. On Friday, 27 APR 2018, I listened to one 2 CD set. 1-2) A 2 CD Tahra release devoted to the work of conductor Hermann Abendroth. CD 1--Tr. 1. J.S. Bach: Orchestral Suite 3: Air on the G String (3'43) |Beethoven: |Tr. 2-5. Symphony 1 in C Major, Op. 21 (22'51) |Tr. 6-9. Symphony 4 in B Flat Major, Op. 60 (31'21) ||CD 2--Tr. 1. Beethoven: Leonore Overture 3 in C major, Op. 72a )13'59) |Tr. 2. Wagner: Die Walkure: Wotan's Farewell (15'48) |Tr. 3-6. 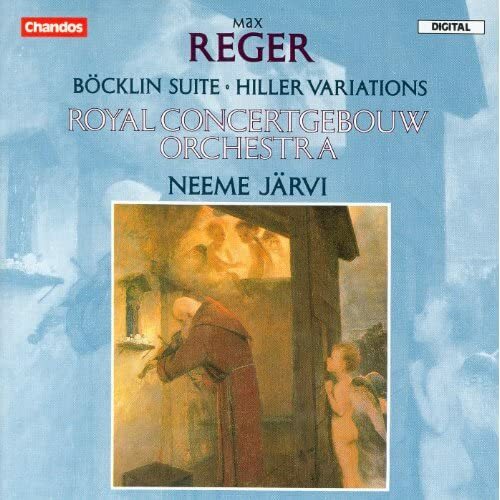 Max Reger: Four Tone Poems after Arnold Böcklin for orchestra, Op. 128 (1913) (24'03). |Tr. 7. Bruckner: Symphony 4" 3rd movement (Scherzo)--rehearsal excerpt (4'29)--Berlin RSO (CD 1, Tr. 1, CD 2< Tr. 1--date unknown, but probably 1950-1), CD 2, Tr. 2, Budapest Opera Orchestra, Sandor Sved as Wotan, rec. date unknown, probably 1953 or 1955). All other tracks rec. by Leipzig RSO. rec. dates Unknown (CD1, Tr. 2-5, but probably from early 1950's, CD 1, Tr. 6-9 rec. 4 DEC 1949, CD2, Tr. 3-6 rec. 15 AUG 1950., Bruckner excerpt rec NOV 1949). The two Beethoven symphonies on CD 1 are very good performances, especially the First., and his Leonore Overture 3 is excellent as well. Wotan's Farewell is rather closely miked, but otherwise very good, and the Reger is composed in a late romantic style, and is probably the most interesting performance here because it is the least well known work. Let me just say I have listened to very little Reger; this impressed me enough that it made me want to hear more. Most Reger I've heard is not so appealing to my ears, but the recording pictured below contains some of his most appealing music, beautifully conducted and recorded. Highly recommended! On Saturday, 28 APR 2018, I listened to 4 CDs. |Tr. 4. The Hinchinbrook Riffs (2003) (8'06)--Craig Ogden, guitar--rec. 2 MAY 2006, The Top Studio, Sarsden, Oxfordshire, England. |Tr. 5-8. String Quartet 2 (2005) (23'03)--Goldner String Quartet (Dene Olding, Dimity Hall, violins, Irina Morozova, viola, Julian Smiles, cello), rec. 22 OCT 2005, Sir John Clancy Auditorium, University of New South Wales, Australia. |Tr. 10. Piano Sonata (1997) (15'15)--Michael Kieran Harvey, piano--rec. JAN 1999 @ University of Newcastle Concert Hall. Tall Poppies CD TP 187, published 2006. (TT: 75'09). Nigel Westlake is an Australian composer. This CD is an excellent introduction to his chamber music and the range of styles which constitute his art. Most of the piano trio sounds more like an accompanied cello sonata with occasional ad libitum violin passages. It is a dark, brooding piece, so dark, in fact, that it often sounds like it could easily be played by a double bassist. In a way, The Hinchinbrook Riffs is the central piece of this CD. First of all, it gives the whole album its title, and the cover has a picture of Hinchinbrook Island, off the northeast coast of Queensland, the northeastern most Australia state. It is a national park, the largest island component of the Great Barrier Reef, 52 square miles of Paleozoic igneous rock. It is a wonderful virtuoso piece for solo guitar, Chopinesque in its complexity. It was called Pouandai by the original Biyaygiri inhabitants. The piece itself is a work of Chopinesque virtuosity, complex and a challenge to the skill of any guatarist. The String Quartet is the most musically sophisticated and complex work, and also, but a slight margin,the longest, on this program. It is in a traditional four movement structure and follows a traditional developmental model. Mvt 1 opens with fragmented gestures, fluctuating in tempo and dynamic, and finds its feet in a driving exploration of changing metres, polyrhythms, displaced accents and percussive effects. It ends in a viola led statement underpinned by repeated demiquavers in the cello and displaced violin pizzicato ostinati. Written in 5/8 time, the short second movement provides a short, comic transitional interlude. The third movement is a contrasting slow movement, but leave one with a feeling of unease as the resolution is incomplete. In the last movement, a series of phrases in the violins, echoed in the cello, are sustained by a viola drone. The mood is broken with a sudden attack, a manic and relentless scherzo with semiquavers, and percussive strings. Kalabash is a piece for four percussionists and is an excellent demo track for a good sound system. It includes 2 marimbas, and Westlake acknowledges inspiration from West African balofon music. The balafon was the forerunner of the marimba. The main difference is that on a balafon, the wooden bars, each of which plays a different note, are suspended above a collection of different sized kalabash gourds instead of being suspended above aluminum resonators, as is the case with marimbas. The Piano Sonata is a three movement work without breaks between the movements. They are marked fast, slow, and very fast. It is polychromatic and very original, and one feels the influence of the composer's percussive and fusion tendencies. Like the first movement, it is dark and brooding, so that these two works prove to be perfect end pieces for the album. 2) W.A. Mozart (1756-91): |Tr. 1-3. Symphony 38 in D Major, K. 504 "Prague" (32'44) |Tr. 4-7. Symphony 39 in E Flat Major, K. 543 (30'37)--Trevor Pinnock, cond, The English Concert. CD 10 of an 11 CD Archiv Produktion set of the complete Mozart Symphonies by these forces. Rec. Henry Wood Hall, London, SEP 1993 (K. 504), & JUN 1994 (K. 543). These are very good performances of these two symphonies. As I have said before, I have two other preferences that definitely stand above this set. Nothing I have heard here changed my mind about that. 3) CD 15 of a 24 CD SONY set titled "Gary Graffman: The Complete RCA & Columbia Album Collection." P.I. Tchaikovsky (1840-93): |Tr. 1-3. Piano Concerto 2 in G Major, Op. 44 (36'16) |Tr. 4. Piano Concerto 3 in E Flat Major, Op. Posth 75 (15'12)--Eugene Ormandy, cond., The Philadelphia Orch. Rec. Town Hall, Philadelphia, 17 FEB 1965. 4) Ralph Vaughan Williams (1872-1958): |Tr. 1-4. Symphony 5 in D Major (1943) |Tr. 5-7. Three Portraits from "The England of Elizabeth" (1957) (17'26) |Tr. 8-10. Concerto for Bass Tuba & Orchestra (1954) (12'19)--Andre Previn, cond., London Symphony Orch., John Fletcher, bass tuba (Tr. 8-10). CD 4 of a 6 CD RCA set of the VW symphonies + 2 concerti + 2 other orchestral works.--Although the accompanying booklet is over 100 pages long in three languages, it contains no information of recording venues or dates, but Music Web International says the 5th is from 1972, the Portraits from 1968, and the Tuba Concerto from JUN 1968. The four movements of the symphony are marked Preludio: Moderato (12'49), Scherzo: Presto (5'14), Romanza: Lento (12'15), and Passacaglia: Moderato (11'13). It was well received, though Vaughan Williams himself had had doubts about it. He used some of the music from a project originally intended for an opera on Bunyan's Pilgrim's Progress, which he had temporarily abandoned (he returned to it later and completed the work). It was not based on war themes, even though it was premiered in the middle of WWII. It was seen as a relatively serene work which was welcomed as a pleasant relief from the rigors of war. Per Wikipedia: The England of Elizabeth is a 1957 documentary about the Elizabethan age, directed by John Taylor for British Transport Films. It is particularly noted for its score composed by Ralph Vaughan Williams. The soundtrack script (by Gloucestershire novelist John Moore) is read by veteran Shakespearean actor Alec Clunes. Vaughan Williams' score was the basis for the concert work Three Portraits from the England of Elizabeth. This recording of the Tuba Concerto is one of a number of recordings which ArchivMusic recommends for this work. In fact, it gets their highest recommendation; although it is one of 5 performances recommended, this is the only recording on which all other works on the CD are by Vaughan Williams, and it is the featured recommendation when you click on the work, before you go to a complete list. I see a number of others, including one by Arnold Jacobs of the Chicago Symphony on a Barenboim DGG CD devoted to performances by CSO soloists. The RVW bass tuba concerto - a marvelous, unique work - was premiered and originally recorded by Philip Catelinet, as the composer wished, with Barbirolli and the London Symphony Orchestra. Catelinet consulted with RVW during the rehearsals, and the recording made the next day is presumably as close to the composer's wishes as possible. The performance I'd most like to hear was by Gerard Hoffnung, who should need no introduction, but his live performance appears not to have been recorded, or at least not uploaded to YouTube. HMV published the recording on a 10" LP, with RVW's lovely oboe concerto on the flip side played by Barbirolli and Evelyn Rothwell (Mrs. Barbirolli). The finale was originally intended as a scherzo in the 5th symphony, and the work as a whole resembles the symphony closely. EMI had recorded it just two years previously with the dedicatee, Léon Goossens; I'd guess that the repeat, so soon, may have been suggested by Barbirolli as a suitable coupling for the tuba concerto, which it certainly was. It too is on YouTube. As for the symphonies, I seem to rotate among 4, 5, and 6 as my favorite of the moment, and presently it's No. 5. There have been many fine recordings, but naturally there's special interest in the composer's own interpretation, recorded with the London Philharmonic at a 1952 Prom Concert. Vaughan Williams was a capable and indeed fearless conductor, as his hair-raising recording of the 4th symphony for EMI testifies; while there's less overt excitement here, as indeed in the music, it's a fine performance. For those who don't know the symphony (and those who do), there's a worthwhile commentary from BBC Radio 3's series "Discovering Music." Musical examples are played to order by a full orchestra; in those days at least, the BBC did such things right. RebLem wrote: Vaughan Williams' score was the basis for the concert work Three Portraits from the England of Elizabeth. A similar piece is Vaughan Williams's "Five Tudor Portraits," a choral setting of poems by the poet John Skelton. My father picked this up in the Capitol recording by the Pittsburgh Symphony and William Steinberg, an unconventional addition to the family record collection - but later I realized it tied in with the course in Renaissance English literature he taught at Franklin & Marshall college. As for "Pilgrim's Progress," my travels as a publisher's representative took me to Brigham Young University in Utah when their opera workshop gave the American premiere. To tell the truth, I was bored pretty much from beginning to end, and haven't listened to the EMI recording. But maybe I should. On Sunday, 29 APR 2018, I listened to 3 CDs. 1) Arvo Part (b. 1935): |Tr. 1-3. Pro et contra: Concerto for Cello & Orchestra (1966) (9'18) |Tr. 4-5. Symphony 1, Op. 9 "Polyphonic" (1963) (19'56) |Tr. 6-8. Collage uber B A C H (1964) (7'30) |Tr. 9. Perpetuum mobile, Op. 10 (1963) (6'56) |Tr. 10-13. Mele aed (Our Garden), Op. 3, A Cantata for Children's Choir & Orchestra (1959, rev 2003) (11'07) |Tr. 14-16. Symphony 2 (1966) (15'06)--Paavo Jarvi, cond., Estonian National Symphony Orch., Truls Mork, cello (Tr. 1-3), Ellerhein Girls' Choir (Tr. 10-13), Tila-Ester Loitme, director. Rec. @ Methodist Church, Tallinn, Estonia, 13-14 FEB 2003 (Tr. 6-8, 14-16), 20-21 JUN 2003 (Tr. 4-5), 27-28 AUG 2003 (Tr. 9). Rec. Estonia Concert Hall, Tallinn, 27-28 AUG 2003 (Tr. 1-3), 26-29 AUG 2003 (Tr. 10-13). A Virgin Classics CD published 2004. (TT: 71'02). Much of Part's life and art have been influenced by changing political winds in Estonia. His work represents a constant tension between his Estonian nationalism and his search for truth and meaning wherever he can find it. Some major changes in his life occurred in the 1970's. That was when he began working in a minimalist style that employs his self-invented compositional technique, tintinnabuli. Pärt's music is in part inspired by Gregorian chant. Since 2010 Pärt has been the most performed living composer in the world, and is considered by many to be the greatest living composer in the world. Also, in the 1970's, he took a major step which might seem to contradict his dedication to Estonian nationalism and freedom from the Communikst yoke: he converted from Lutheranism, historically the dominant religion in Estonia, to Russian Orthodoxy, and since then much of his work has been liturgical. All the works on this program were written before those monumental changes in Part's life, when he was still exploring many different alternative ways of composing, trying to find his voice. Sometimes, Part switches styles even within a work. Such is the case with the Cello Concerto. The first movement is the most radically dissonant--the very first notes are of all twelve pitches in the scale sounding together, some of the most cacophanous music ever written, and then proceeds to test the instrument's survival by striking various parts of the cello with hand and bow stick. A tone row is put together, but provides no satisfactory resolution. The second movement, which lasts all of 31 seconds, is four bars of stylized D Minor baroque music, lyrical and charming but very brief. The conflict is only partially resolved in the third movement, which attempts, with limited success, to resolve the conflict between the modern and the baroque. The Perpetuum mobile is a series of overlapping, restless waves of chord clusters. In the Collage, the outer movements are for strings alone, but the central movement, the Sarabande, is inspired by the Sarabande from Bach's English Suite # 6. It adds oboe and harpsichord to the mix, and again we see the tension between old forms and new techniques competing for Part's attention and favor. On the surface, Mele aed (Our Garden) is simple children's music. The narrative in the booklet compares it to Tchikovsky's Nutcracker and Prokofiev's Peter & the Wolf, but it reminded me more of some of the music for children written by Benjamin Britten. It is mostly simple, naive melodies, but even here, politics intrudes with occasional dissonant interjections and disruptions, providing us with an allegorical narrative about the intersection of politics and the innocence of childhood. And finally, we have the Second Symphony in which Part seems to resolve some of his conflicts and settle on a position re: the regime. "Governed by seemingly random, threatening sounds, of which a battery of children's squeaky toys is very much a part, not an opponent, this symphony takes dissonance to almost unbearable levels, whether in splintered shards or massive blocks. Rven the doomsday octaves of the tympani in the finale, seemingly on the retreat, crescendo again to initiate further horrors. Then out of it all tumbles a Petrushka-like barrel-organ strains. The ensuing arrangement, with the melody tenderly sung by woodwinds and violins, reveals it as "Sweet Day Dreams" from Tchaikovsky's 1878 piano Album for the Young. One more angry clash derides the possibility that innocence could save the world, but fiercely protective open strings fight back, and leave the fragile voice of childhood alone on the darkened stage." --notes by David Nice, 2004. 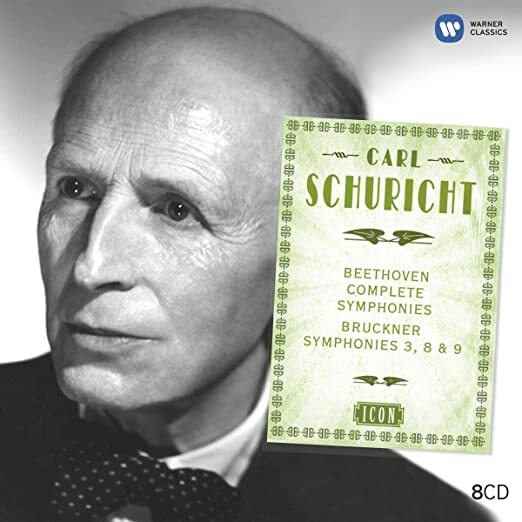 2) CD 5 of the 10 CD set titled "Carl Schuricht: The Complete Decca Recordings." |Tr. 1-3. Johannes Brahms (1833-97): Violin Concerto in D Major, Op. 77 (39'35)--Christian Ferras, violin, Wiener Phil. Rec. Musikverein, Wien, 19-20 APR 1954. |Tr. 4-6. Max Bruch (1838-1920): Violin Concerto 1 in G Minor, Op. 76 (24'26)--Georg Kulenkampff, violin, Tonhalle-Orchester Zurich--Rec. Radio Studio, Zurich, 23, 27 JAN 1947. These are interesting documents, but neither of these performances are anywhere near the top of the heap. For the Brahms, my favorite remains the classic Szeryng/Monteux/LSO recording. 3) CD 5 of the 5 CD Memories set of Pierre Monteux recordings of the Beethoven Symphonies. |Tr. 1-4. Symphony 9 in D Minor, Op. 125 "Choral" (62'25)--Eleanor Steber, soprano, Freda Gray Masse, contralto, John McCollum, tenor, David Laurent, bass, Boston Symphony Orch. live @ Tanglewood 31 JUL 1960. First of all, the timings on this one are pretty simple--Mvt 1--15 min., Mvt 2--11 min., Mvt 3--13 min. Mvt 4--23'25. The sound here is plagued with a lot of hiss, and it sounds about 12 or more years older than it really is. The vocal quartet is superb, and very evenly matched--not a dud in the bunch, and they meld together well. I especially appreciate Monteux's performance of the third movement. In the middle of the movement, Beethoven marks a transition from adadio to andante moderato. Most conductors ignore this, take a breath, and proceed at the same pace as before. Monteux respects Beethoven's marking in this regards and speeds up, and it has a bracingly wonderful effect on the performance. On Monday, 1 MAY 2018, I listened to one CD. |Tr. 1-4. N. Rimsky-Korsakoff (1844-1908): Scheherazade, Op. 35, symphonic suite (1888) (31'46) |Tr. 5-11. S Prokofiev (1891-1953): Romeo & Juliet, Op. 64a & b excerpts: Suite 2, # 1, and Suite 1, #s 2-7--Karel Ancerl, cond., Berlin RSO (Tr. 1-4, rec. 23 & 25 JAN 1957), Leipzig Gewandhaus Orch. (Tr. 5-11, rec. 29 NOV 1961). Tahra CD. I should note that on the disc, the first work is spelled without the first "c." These are both very energetic and dramatic readings of their respective scores. No one who loves these works should be without this CD, especialy the Rimsky-Korsakov. The liner notes include an excellent essay of Ancerl's life and its many trials and tribulations, especially the fact that he was visiting Tanglewood when Russian troops marched into Czechoslovakia and overthrew the Dubcek government beginning 21 AUG 1968. The essay spends a great deal of time about the details of Ancerl's family and the fact that he was able to get his whole immediate family to come to Toronto with him. He himself had been visiting Tanglewood for the summer festival. On Wednesday, 2 MAY 2018, I listened to 3 CDs. 1) Max Bruch (1838-1920): |Tr. 1-4. String Quintet in E Flat Major, Op. posth. (1918) (17'15) |Tr. 5-8. String Quintet in A Minor, Op. posth (1918) (23'24) |Tr. 9-11. String Octet i B Flat Major, Op. posth (1920) (22'08)--The Nash Ensemble (Stephanie Gonley, violin [all], Laura Samuel, violin [Tr. 1-8], Annabelle Meare, violin [Tr. 9-11], Michael Gurevich, violin [Tr. 9-11], Lesley Hatfield [Tr. 9-11], Lawrence Power, James Boyd, violas [all], Bjorg Lewis, cello [Tr. 1-4], Adrian Brendel, cello [Tr. 5-11], Peter Buckone [Tr. 9-11]). An Hyperion CD, rec. All Saints Church, East Finchley, London 18-20 APR 2016. TT: 62'48. Max Bruch, of course, is best known for his violin concerti, which, for some reason, have never particularly appealed to me. His three symphonies are a little more appealing, but still no great shakes. It is in his chamber music, in my opinion, that he really shines. These are wonderful works, tuneful and well developed. Highly recommended. 2) W.A. Mozart (1756-91): |Tr. 1-4. Symphony 40 in G Minor, K. 550 (32'51) |Tr. 5-8. Symphony 41 in C Major, K. 551 "Jupiter" (39'32)--Trevor Pinnock, cond., The English Concert. CD 11 of an 11 CD Archiv Produktion set of all the Mozart symphonies by these forces. Rec. Henry Wood Hall, London, 9/1994 (K. 550), 1/1995 (K. 551). These are excellent performances, right up there with the best. They are fleet and stylish. My favorites, though, remain the recordings in the Hogwood set on L'Oiseau-Lyre. They do two different versions of #40 and of # 31, for example. That completeness is why it runs to 19 CDs while this one from Pinnock is only 11. But its not just the meticulous schoarlship that holds one's attention there; it is the magnificent performances as well, which I feel outdo all others. I suppose my second favorite set is in the cycle of the last 6 Mozart symphonies that is part of a 5 CD Mozart box on Virgin Classics conducted by Yehudi Menuhin. And, in these last two symphonies, I would not want to be without Szell or Klemperer either. Klemperer's tempos are all wrong, but he is magnificent even in his failures, because the slower pace in the contrapuntal movements clarifies the structure of the symphonies for the ordinary listener (among whom I count myself) that help one appreciate other performances more. 3) Sergei Prokofiev (1891-1953): |Tr. 1-3. Piano Conerto 3 in C Major, Op. 26 (27'53) |Tr. 4-7. Piano Concerto 1 in B Flat Major, Op. 10 (15'06) |Tr. 8. Piano Sonata 3 in A Minor, Op. 28 "From Old Notebooks" (7'06)--Gary Graffman, piano (all), George Szell, cond., Cleveland Orch. (Tr. 1-7). Rec. Severance Hall, Cleveland, 25 MAR 1966 (Tr. 1-3), 26 MAR 1966 (Tr. 4-7). Tr. 8 rec Columbia 30th St Studio, NYC 7 DEC 1962. CD 16 of a 24 CD SONY box titled "Gary Graffman: The Complete RCA & Columbia Album Collection." I learned these two concerti from these performances, in the original LP format. For a long time, they were the only performances of these works I had. I have heard others since, and several have replaced this one in my affections. A Moravec/Ancerl/Czech Phil recording of the 1st on Praga, and a recording by Samson Francois of the 3rd with Witold Rowicki and the Philharmonia Orch. Francois also did the 5th PC with them, which is my favorite recording of that concerto, too. But every now and then, I like to return to these Graffman/Szell performances for old times sake, and also because they are very good. Last edited by RebLem on Thu May 03, 2018 2:21 am, edited 1 time in total. There are two well-known versions of the G minor symphony; Mozart added clarinets in the second. But I've never heard of a second version of the Jupiter from Mozart's hand. What's the difference? There's no arguing about tastes, but Hogwood's non-interpretations of Mozart are near the bottom of my list. If one wants a HIP recording then I suppose my choice would be Mackerras, but there are so many outstanding recordings by great conductors that I don't need to stoop so low. I erred. Two versions of #40, but not the Jupiter. It does have two versions of # 31, though. I have corrected the narrative. Mozart composed a new slow movement for #31 apparently in order to get it published - publication of symphonies was rare in those times. He had also composed a new finale for his piano concerto no. 5 in order to please his new Viennese audience. But the rescoring of the 40th symphony must have been just to please himself, loving the clarinet as he did. Why he didn't include clarinets in the first version is a minor puzzle, as they play such an important part in the 39th symphony composed at the same time. Do the notes for the Pinnock recording offer an explanation of why and when? On Thursday, 3 MAY 2018, I listened to 3 CDs. 1) Ralph Vaughan Williams (1872-1958): |Tr. 1-4. Symphony 6 in E Minor (1947) (34'25) |Tr. 5-8. Symphony 9 in E Minor (1958) (38'39)--Andre Previn, cond., London Symphony Orch. Though this release includes a lavish 104 page booklet (including front and back covers), it has no information on recording dates or venues. Rec. years obtained from other sources--# 6 rec. 1968, # 9 in 1971. CD 5 of a 6 CD RCA set including all the VW Symphonies + 4 other works by these forces. "Following his tranquil and somewhat reassuring fifth symphony, Vaughan Williams again took the musical world off cugard--in 1948--with his sixth symphony, composed during 1944-47. Here again was more dissonance, more starkness and biting despair, at least in the first three movements. Yet, it was the final movement, the Epilogue, which--though far different from the chaotic finale of the fourth symphony--gave rise to the most intensive comment and speculation in contrast to the frightening crescendoes and savage tuttis of the preceding parts, this finale was composed in an unbroken pianissimo from first to last, but such a strange, desolate and unearthly pianissimo as had never been heard before." --from the liner notes. Although some speculated that this was about the invention of the atom bomb and the looming prospect of annihilation on a global scale, Vaughan Williams denied any programmatic intent. The ninth symphony was poorly received at its premiere in 1958, conducted by Malcolm Sargent. "Only a handful," wrote critic Michael Kennedy, "heard a new richness of sound and the beginning of what might have proved to be an extraordinarily fruitful Indian summer." One of the more striking aspects of this symphony is that he used both saxophone and flugelhorn in this work. Of the flugelhorn, he wrote, "This beautiful and neglected instrument is not usually allowed in the select circles of the orchestra and has been banished to the brass band, where it is allowed to indulge in the bad habit of vibrato to its heart's content. While in the orchestra, it will be obliged to sit up and play straight. The saxophones, also, are not expected, except possibly in one place in the Scherzo, to behave like demented cats, but are allowed to be their own romantic selves." For inspiration, Vaughan Williams drew from a wide range of sources, from the organ part of the opening of Bach's St Matthew Passion to Gustav Mahler in the Scherzo. 2) CD 6 of a 10 CD set titled "Carl Schuricht: The Complete Decca Recordings," devoted to overtures by Felix Mendelssohn (1809-47) and Carl Maria von Weber (1786-1812). |Tr. 1. Overture: The Hebrides aka Fingal's Cave, Op. 26 (9'51) |Tr. 2. Overture: The Fair Melusine, Op. 32 (11'16) |Tr. 3. Overture: Ruy Blas, Op. 95 (7'37) |Tr. 4. Overture: Calm Sea and Prosperous Voyage, Op. 27 (11'54) |Tr. 5. Weber: Overture: Abu Hassan, J 106 (3'18)--Wiener Philharmoniker, Great Hall, Musikverein, Wien, 26-27 APR 1954 (Tr. 1-4), London Philharmonic Orch., rec. Kingsway Hall, 31 MAR 1948 (Tr. 5). All these are superb performances, highly recommended. 3) Joseph Kosma (1905-69): Songs (18 titles, 37 tracks, I'll be damned if I'm going to list all of them!) --Francois Le Roux, baritone, Members of the Matrix Ensemble (Levine Andrade, violin, Gustav Clarkson, viola, Julia Desbrusiasis, cello, Karen Street, accordion), Matthew Hunt, clarinet, Jeff Cohen, piano. Rec. Air Lyndhurst, London, 3-6 APR 1997. A Decca CD. Kosma was born in Budapest, and lived there until 1928. He studied music and became assistant conductor of the Budapest Opera, and was involved as a rehearsal pianist in the preparation for the premiere of Bartok's Miraculous Mandarin. I 1928, he got a grant which allowed him to travel to Berlin to study and work further. In March, 1933, he fled the encroachment of the Nazis and moved posthaste to Paris. He had a hard go at first, because he went there without knowing a word of French, but he gradually and laboriously worked his way up in the world. He made two friends who became colleagues and were very helpful in his career--the first was Jacques Prevert, a poet and screenwriter. Kosma set many of Prevert's songs to music, and Prevert introduced Kosma to the great filmmaker Jean Renoir. One of Kosma's great achievements was that he composed a lot of film music, including the score for Renoir's 1937 magnum opus, "La Grande Illusion." This album is part of Decca's series on "Entartete Musik: Music suppressed by the Third Reich." Then, of course, the war broke out, and Kosma was caught in Nazi-occupied France. He was forbidden to compose and placed under house arrest because his mother was Jewish. His mother and his mentally disabled brother Akos, in fact, were killed in a massacre by the Arrow Cross Nazi auxiliaries on the banks of the Danube. His father, however, lived until 1957 and was able to enjoy his son's success. And he continued to compose under an assumed name, assisted by his friend Jacques Prevert. to films by Prevert and another friend, Marcel Carne. When the Gestapo started rounding up Jews in France in 1944, he took refuge with the Resistance and was able to escape to the newly liberated Nice, but was wounded in a Nazi bomb attack 28 AUG 1944, but not mortally. Several were killed, and he suffered from the after effects for the rest of his life. He returned to Paris in October, 1944, and began one of the most productive periods of his lfe, composing not only for film, but also ballets. On Friday, 4 MAY 2018, I listened to one CD. Tr. 1. Francois Couperin (1668-1733): La Sultane, introduction & allegro (orch. by Darius Milhaud) (7'42) |Tr. 2-5. L.V. Beethoven (1770-1827): Symphony 9 in D Minor, Op. 125 "Choral" (61'30)--Pierre Monteux, cond., Orhcestre National de la R.T.F., Choeur del la Radiodiffusion Francais, Rene Alix, director, Maria Stader,m soprano, Helene Bouvier, mezo-sopano, Libero De Luca, tenor, Josef Greindl, bass. A Tahra release, rec. live @ Theatre des Champs Elysees de Paris, 6 NOV 1958. This was part of Monteux's last concert in Paris. It also included a Hindemith Suite, Noblissima visione, but that is not included here probably because a) it may have necessitated a second CD and b) because it was probably still copyrighted and Tahra didn't want to pay royalties. Couperin and Beethoven, of course, are safely out of copyright protection. This is a fine concert. The Couperin sounds almost romantic in Monteux's hands, though it is, of course, a baroque work. The Beethoven is also excellent, especially the third movement; one pictures a verdant garden, which is strrange for a November performance. The last movement is marred by uncertain miking, but the performance itself is wonderful. Josef Greindl turns in a particularly strong performance. Recommended. Couperin is in the public domain but Milhaud's arrangement, composed in 1944, may not be. "Nobilissima Visione" was composed in 1930 and should be in the public domain. Either your first reason or some other we haven't thought of may be the answer. On Saturday, 5 MAY 2018, I listened to 3 CDs. 1) Tr. 1-3. Robert Schumann (1810-56): Piano Concerto in A minor, Op. 54 (1845) (28'45) |Tr. 4-6. Frederic Chopin (1810-49): Piano Concerto 2 in F Minor, Op. 21 (1830) (30'57)--Clara Haskil, piano, Rafael Kubelik, cond., Orchestre de la Radio Danoise, (Tr. 1-3), rec. 17 FEB 1955 live in concert |Orchestre de la Societe des Concerts de Conservatorie Paris, rec. 31 JAN 1960 live in concert. A Tahra CD. The Schumann is a first time release. The liner notes tell us, "This concert was recorded in Copenhagen via the telephone but two minutes are lost (at the end of the second movement and the beginning of the third). We filled this gap with the same passage taken from the concert with Kletzki in July, 1953." "Holy crappolini," I thought. Over the phone? Two minutes from another concert patched in? This is going to be horrible, I thought. Well, somehow, it isn't. The sound is no where near as good as the best recordings from 1955 (the Keilberth Bayreuth Ring cycle from that year comes to mind), but it sounds as good as some of the best records from, say, 1950 or so. And the patching is seamless. So, against all odds, it works. And it is a fine, lyrical performance. The Chopin is from 1960 and has no real sourcing problems, so the sound is much better here. It is, of course, a virtuoso piece, but Haskil handles it with such deft ease that one is impressed, again, more by its lyricism than its virtuosity. Recommended. |Tr. 2. "...two feelings...", Music with Leonardo (1991-2) for 2 speakers & ensemble (22'48), rec. Slowakische Philharmonie Bratislava, 12-15 FEB 1995. |Tr. 4. Consolation II for 16 strings (1968) (5'39)--rec. Kapelle/Plock, Heidelberg 15-16 SEP 1997. Klangforum Wien, Hans Zender, cond. (Tr. 1-2), Schola Heidelberg (Tr. 3, 4) & ensemble aisthesis (Tr. 3), Walter Nussbaum, cond. A KAIROS CD. Per Wikipedia, "Helmut Friedrich Lachenmann (born 27 November 1935 in Stuttgart) is a German composer associated with "musique concrète instrumentale"....Lachenmann was born in Stuttgart and after the end of the Second World War (when he was 11) started singing in his local church choir. Showing an early aptitude for music, he was already composing in his teens. He studied piano with Jürgen Uhde and composition and theory with Johann Nepomuk David at the Musikhochschule Stuttgart from 1955 to 1958 and was the first private student of the Italian composer Luigi Nono in Venice from 1958 to 1960. He also worked briefly at the electronic music studio at the University of Ghent in 1965, composing his only published tape piece Szenario during that period, but thereafter focused almost exclusively on purely instrumental music. The brutality of his music led Francisco Estévez to compare his work to the paintings of Francis Bacon." It is hard to describe Lachenmann's music. My best advice is to go to YouTube and listen to a few things. I am at a loss for words. 3) F.J. Haydn (1732-1809): Tr. 1-4. Symphony 41 in C Major (20'30) |Tr. 5-8. Symphony 44 in E Minor "Trauersinfonie" (25'56) |Tr. 9-12. Symphony 47 in G Major (25'33)--Thomas Fey, cond., Heidelberger Sinfoniker. A Hanssler Classics CD rec. 8-9 MAY & 13-15 SEP 2006 Burgerhaus Morlenbach. Thomas Fey was a young conductor of great promise, and one of the things he set out to do was to record the complete Haydn Symphonies with the Heidelberger Sinfoniker, which he founded. His principal mentor was Nikolaus Harnoncourt. Unfortuanately, in 2014, he had a severe traumatic brain injury in a domestic accident. Details are not available. The circumstances under which he suffered this injury are very hush-hush. Hopes for his eventual recovery seem to be fading. He seems to have recorded 58 of the symphonies. These are excellent HIP performances with a modern orchestra. RebLem wrote: The liner notes tell us, "This concert was recorded in Copenhagen via the telephone but two minutes are lost (at the end of the second movement and the beginning of the third)." Over telephone lines from the hall to the recording studio perhaps, but surely with at least one microphone rather than a telephone receiver. (There were no mobile phones in 1955.) The notes apparently don't say the concert was broadcast, so I'd guess the recording was privately made for the artists or possibly some rich person. The missing minutes suggest that the recordist may have had only one tape recorder and had to change tape reels at that point. Such recordings were often made in New York; Carnegie Hall offered that service at a considerable price, which is how the Simon Barere live recordings and much else happened to be made. On Wednesday, 9 MAY 2018, I listened to 3 CDs. 1) Robert Schumann (1810-56): Tr. 1-21. Carnaval, Op. 9 "Little Scenes in Four Notes" (1835) (26'25) |Tr. 22-34. Etudes symphoniques in C Sharp Minor, Op. 13 (25'19)--Gary Graffman, piano, CD 17 of 24 in a SONY box titled "Gary Graffman: The Complete RCA & Columbia Album Collection." E♭, C, B, A – signified in German as Es-C-H-A. The first two spell the German name for the town of Asch (now Aš in the Czech Republic), in which Schumann's then fiancée, Ernestine von Fricken, was born. The sequence of letters also appears in the German word Fasching, meaning carnival. In addition, Asch is German for "Ash," as in Ash Wednesday, the first day of Lent. Lastly, it encodes a version of the composer's name, Robert Alexander Schumann. The third series, S-C-H-A, encodes the composer's name again with the musical letters appearing in Schumann, in their correct order." 2) CD 6 of a 6 CD RCA set of the symphonies + 4 other orchestral works of Ralph Vaughan Williams (1872-1958), with Andre Previn conducting the London Symphony Orch. : |Tr. 1-10. Symphony 7 "Sinfonia Antarctica" (1952) (44'01)--Ralph Richardson, speaker, Heather Harper, soprano, The Ambrosian Singers |Tr. 11-14. Symphony 8 in D Minor (1955) (28'34)-no information on recording dates or venues provided in the lavish 104 page booklet which accompnanies this release. These two works are antipodes in a way: Sinfonia Antarctica is the only Vaughan Williams symphony which the composer himself acknowledged was programmatic, while the 8th Symphony is absolute music and the only VW symphony to which no critic of consequence ever tried to assign a program. The Sinfonia Antarctica was originally movie music for the film Scott of the Antarctic, the original score of which has only recently been recorded in modern sound. Here, Ralph Richardson provides brief spoken introductions to each movement, a feature the more famous Boult performance does not have. The soprano and chorus are simply there as vocal instruments; they do not sing a text. As befits the subject, the work is unrelentingly bleak. Per Wikipedia, "The Eighth Symphony is the shortest of Vaughan Williams' nine symphonies, with a typical performance taking just under a half hour, yet it is remarkably inventive, especially in the composer's experiments in sonority. Not only does he use a much-expanded percussion section, including "all the 'phones and 'spiels known to the composer" (as well as three tuned gongs, the same as were used in Puccini's Turandot), but the two central movements use only the wind section and string section respectively. The Fourth symphony is the only other one of his symphonies to end loudly. (The others all have quiet conclusions, often with the Vaughan Williams "fingerprint" niente.)" It was an immediate popular and critical success, and reveals the composer had never become stale or predictible; he was still doing new things in his music right up to the end of his lfe. 3) Ermesto Halffter (1905-89): |Tr. 1-4. Sinfonietta (1925) (26'12) |Tr. 5. Elegia en memoria de S.A.S. el principe de Polignac (Elegy in memory of HSH the Prince of Polignac) for choir & orchestra (1966) (7'46) |Tr. 6. Psalm XXII "Eominus Pastor Menus et Hospes Meus" (The Lord ruleth me; and I shall want nothing) (11'33) |Tr. 7. Psalm CXVI "Hymnus Laudis et gratiarum action" (O Praise the Lord, all ye nations, praise him, all ye people) (1'40)--Victor Pablo Perez, cond., Orquesta Sinfonica de Tenerife, Coro polifonico de la Universidad de Laguna, Carmen Cruz Sino, dir. (Tr. 4), Ondrej Lewit, violin, Robert Pytel, cello, Peter Jones, bass (soloists in Tr. 1-4), Susan Chilcott, soprano, Claire Powell, mezzo-soprano, Joan Cabero, tenor, Jose Antonio Carril, bass (SATB soli in psalms). A harmonia mundi france CD. Recorded at the Auditorium of the University of La Laguna from 21 to 29 September 1989, per the statement on the inside back cover of the liner notes booklet, although the narrative says the recording was made in the year of the centennial of Halffter's birth, which was in 2005. Did they keep these recordings in the can and only make the CDs and release them 16 years later? Per Wikipedia, "Ernesto Halffter was the third son of Prussian jeweller Ernest Halffter Hein and his wife Rosario Escriche Erradón. He was the younger brother of composer Rodolfo Halffter and the uncle of composer Cristóbal Halffter." A critic friend of his, in his early life, introduced him to Manuel de Falla, who took him on as a student and a friend. The Sinfonietta is one of his earliest and most important compositions, revealing the influence of Domenico Scarlatti. Although he was born and died in Madrid, he went into exile in Lisbon during the Spanish Civil War and returned after the end of the civil war. After the death of his mentor Manuel de Falla in exile in Argentina, Halffter completed the manuscript for Falla's Atlantida, but he revised it several times in subsequent years until the premeire of the final version in Lucerne in 1976. His settings of the two psalms were influenced by Stravinsky's Symphony of Psalms. The Elegia was premiered in Montecarlo by Wolfgang Sawallisch in 1966, an indication of the fame and renown he had achieved. It makes use of Psalm C (MIsericordiam et judciam) and Chapter 7: 12-16 of the Book of Daniel. On Thursday, 10 MAY 2018, I listened to 2 CDs. 1) CD 7 of a 10 CD box titled "Carl Schuricht: The Complete Decca Recordings." |Tr. 1-4. W.A. Mozart (1756-91): Symphony 35 in D Major, K. 385 "Haffner" (17'57) |Tr. 5-6. F. Schubert (1797-1828): Symphony 8 in B Minor, D. 759 "Unfinished" (22'14) |Tr. 7. Robert Schumann (1810-56): Overture: Manfred, Op. 115 (10'29)--Wiener Philharmoniker, Great Hall, Musikverein, Wien, 3-21 JUN 1956 (Tr. 1-6), London Philharmonic Orch., Kingsway Hall, 31 MAR 1948 (Tr. 7). The works on this CD were chosen with care because they make a nice program and tell us a lot about Schuricht's views of these three composers, particularly Schubert. We go from classical music (in the strictest sense of that term) in Mozart through Schumann, a full on romantic composer. The question is, "How doe Schuricht view Schubert?" Usually, he is seen as a transitional composer, on the cusp between the two traditions. In this performance, however, Schuricht tells us that he thinks Schubert, at least by the time he composed the 8th Symphony, was a full on romantic composer. This is not a wishy-washy, compromising performance. It is all out romanticism from beginning to end. 2) P.I. Tchaikovsky (1840-93): Tr. 1-4. Symphony 4 in F Minor, Op. 36 (40'49) |Tr. 5. Ouverture solennelle, Op. 49 "1812" (15'15)--Willem Mengelberg, cond., Concertgebouw Orch., Amsterdam. Studio recordings, 11. 15 JUN 1929 (Tr. 1-4), 9 APR 1940 (Tr. 5). CD 1 of a 2 CD Memories Reverence set of Mengelberg Tchaikovsky performances. "You ask if I keep to established forms. Yes and no. There are certain kinds of compositions which imply the use of familiar forms, for example symphony. Here I keep in general outline to the usual traditional forms, but only in general outline, i.e. the sequence of the work's movements. The details can be treated very freely, if this is demanded by the development of the ideas. For instance, in our symphony the first movement is written with very marked digressions. The second subject, which should be in the relative major, is minor and remote. In the recapitulation of the main part of the movement the second subject does not appear at all, etc. The finale, too, is made up of a whole row of derivations from individual forms...."
Mengelberg, to put it mildly, exercises considerably more freedom of interpretation in this 1929 recording, the only recording of this work he ever made, than is now customary. But it is a fascinating document from one of the great conductors of the 20th century, even though his approach is now out of fashion. The sound is amazingly good for 1929. By contrast, the 1812 overture from 1940 almost seems one of classical restraint. Again, for the period, the sound is amazingly good, although a lot of background his remains in both these performances. This is a measured, balanced performance that does not overdo the spectacular aspects of the score. Recommended. Halffter's Sinfonietta is a delightful neoclassical piece reminiscent of Stravinsky's "Pulcinella," known to us elderly record collectors from the Decca recording by the short-lived Ataulfo Argenta. We played it often on WHRB. Argenta's health was always frail as he suffered from tuberculosis, but he died at 44 in his home from carbon monoxide poisoning - that would require some explanation but Wikipedia gives none. Another victim of the 1950s which were so deadly for musicians. He made remarkably many recordings for Decca and other labels, mostly but not entirely of Spanish music. "It was just at the point where he could look forward to enduring success and artistic fulfillment that Ataulfo Argenta threw his life away with an act of thoughtlessness. One evening in January, 1958 he returned home with a student, and as his study was cold they went to the garage beneath while it warmed up. Argenta switched on the car engine and heater, but the garage doors were shut. The student was found unconscious and Argenta died of carbon monoxide poisoning. He was only forty-four." A the time of his death, he was being groomed by Ernest Ansermet to take over as music director of the Suisse Romande Orchestra. Decca also had plans for him to conduct the Israel Philharmonic, and he had already been scheduled to record a set of the Brahms symphonies with the Wiener Philharmoniker in the spring of 1958. He really was on the cusp of many bigger and better things when he died. It was the last recording he made. The recitativo passages at the opening of the Andante; perfect heaven. 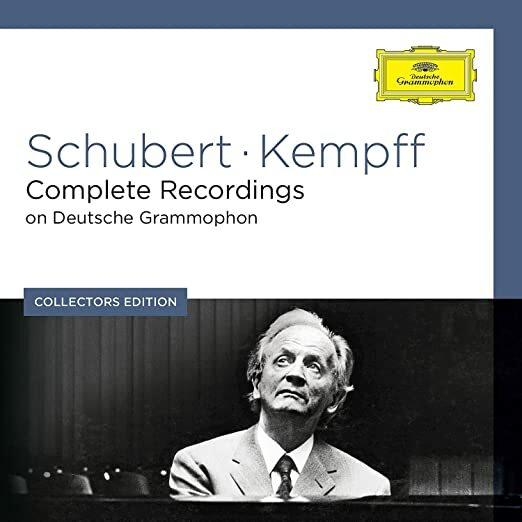 Kempff is my go-to pianist for Schubert, along with the young Alfred Brendel in the Impromptus. I'm open to newer pianists, of course, and will report when I find them!